It’s been 6 months since we found out Aidan was on the Autism Spectrum with PDD-NOS and it has felt like I have been on spin cycle every day ever since. I’ll never forget the morning he got the diagnosis, going in I was completely torn. I wanted a diagnosis, I mean I wanted to know what was wrong with my little guy BUT who would ever want something to be wrong with their child? At the same time feeling scared that another doctor was going to look at me like I was crazy and say “oh no he’s just a two year old”. Then we went through the test where the doctor asked me and his early intervention coordinator (yes she went to the appointment with me, she really is THE BEST!) a bunch of questions and then played with Aidan. At the end of the appointment she scored his results and told me she was diagnosing him with PDD-NOS. I fought back the tears even though I had anticipated the results; I hated to imagine what he was going through. 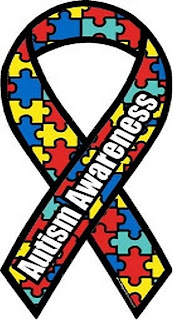 The next few weeks were an emotional rollercoaster, Between being happy to have answers, sad that he had the diagnosis, and mad that it took so long to get it, I was feeling plain Crazy and since Hubby was working 18 hour days back then and didn’t really have any idea what Autism was I was feeling very lonely. But all these feeling soon passed because I quickly realized I didn’t have time to have a pity party I needed to find every way possible to help improve my sons condition! Right now Aidan receives services 5 days a week from different therapists, he has a speech therapist, developmental therapist, occupational therapist, autism therapist, and two floor time therapists. Luckily our insurance covers it all because we could never afford this type of care. My little guy is VERY busy but luckily he loves all of the wonderful ladies that come out to see him so he really enjoys it. These services have helped him so much there are days I look at him and think how could there possibly be anything wrong with him, this is all wrong…. Then he has a melt down or a really unregulated day and I am smacked back into reality. Yet no matter the struggles we have and will face I can’t say that I would change anything given the chance because he is hands down the funniest most loveable little boy I have ever loved! Previous Post: « We Survived Lillys 48 Hour EEG!